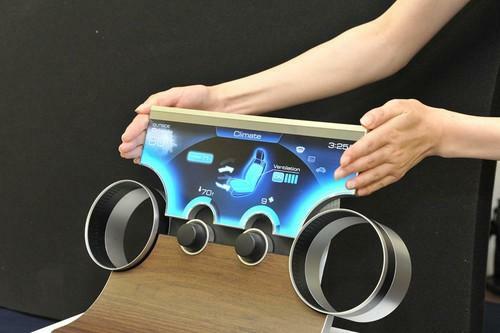 Sharp's prototype LCD Free-form Display can be made to fit virtually any shape. It could be used for high-resolution car dashboards. If Sharp's latest display is any indication, car dashboards could soon have LCDs that fit into all kinds of nooks and crannies. The electronics maker has announced a prototype Free-form Display that can be made in whatever two-dimensional shape is required. Potential applications include dashboard displays incorporating multiple circular contours, wearable computers with elliptical screens, tablets and smartphones without frames, and complex digital signage. Instead of incorporating the gate driver on the perimeter of the display, the Sharp prototype disperses its function throughout the screen's pixels. The bezel, or area that surrounds the screen, can thus be shrunk. While it's not the first non-rectangular LCD screen, Sharp's prototype is the first thin-bezel LCD that allows for various screen shapes, the company said. The displays of some smartwatches on the market feature non-rectangular displays, but Sharp said its prototype offers far greater resolution than smartwatches due to its IGZO (indium gallium zinc oxide) transparent crystalline semiconductors. IGZO displays have smaller pixels than conventional LCD screens. Sharp began mass production of IGZO displays for smartphones last year. Now it wants to bring the new IGZO polygonal displays to other popular products. "We have proposed this technology to major car companies and they are very keen to use this technology in their future models," a Sharp spokeswoman wrote in an email. "For the first commercialization, it may take two to three years but we are targeting to commercialize it by 2017." The cost of the LCD would depend on the application involved, size and design of the screen, the spokeswoman said, declining to comment further.